Welcome to the Kids Page! The kid's page is where you'll find information about programs and activities for children from newborns to tweens. We strive to provide a variety of activities to promote early literacy and support learning. Join us for Creativity and imagination in action! Work individually or in teams to create this month's challenge. We will have a new theme every month that will be revealed at the program. Please do not bring your own legos. This program is for ages 7-12. Call the library for details at (920)596-2252. Pop in any time between 2:45 - 4:45 p.m. and help us celebrate Earth Day! We'll create a small, fun, water craft. Cultivate a love of reading in your child early on! Join us for 30 minutes of stories, songs, rhymes, fingerplays, crafts, and fun. Stay and play after the program – this is a great opportunity to meet other families in the area and enjoy the library! Best suited for ages 5 and under. Come to one session or come to all. No registration required. 15 minutes of reading aloud each day can change the face of education in this country. Learn more about this National Campaign. Reading aloud is the single most important thing a parent or caregiver can do to help a child prepare for reading and learning. Nationally, 37% of children arrive in kindergarten without the skills necessary to begin their learning journey. If a child is not reading at grade level by the end of the first grade, then there is an 88% probability the child will not be reading at grade level by the end of the fourth grade. Even in higher income households, nearly 40% of families do not read aloud every day. More than half the children in this country 13 million children will not hear a bedtime story tonight. 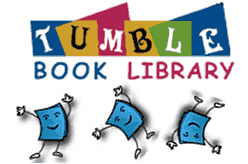 Don't miss our TumbleBook Library of online animated, talking picture books! A library card # is required from outside the library.